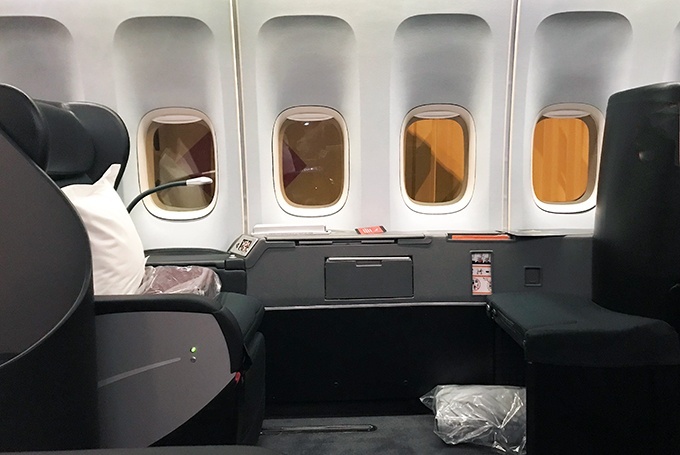 These are the best Qantas business class seats Sydney to Tokyo. I share a little secret that you can scoop a first class seat at business class prices for some flights on this leg. There is a little secret amongst frequent flyers that know the Sydney to Tokyo Haneda (and return) leg well. You are able to choose a first class seat at business class prices on select Boeing 747-400s that fly this route. 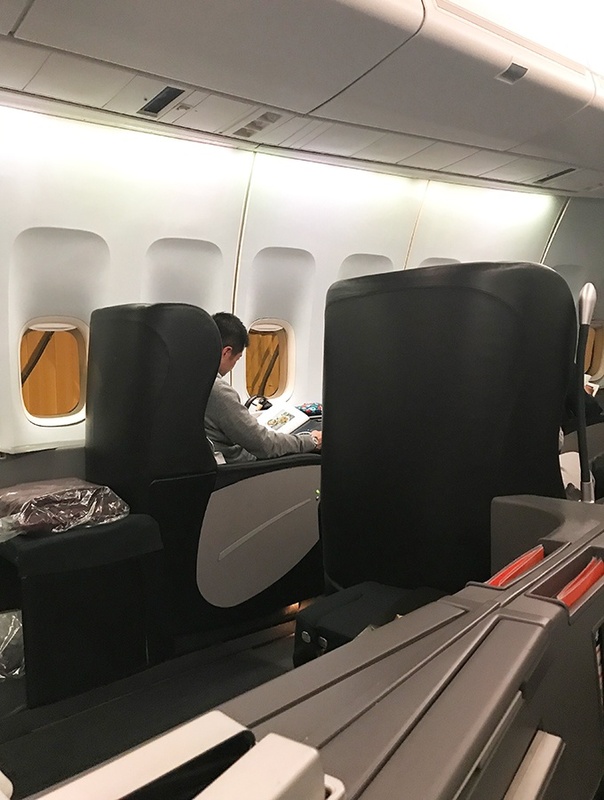 These are the best Qantas business class seats on the Sydney to Tokyo route at present. There is a hitch, they aren’t the latest first class fit out by Qantas. In fact, the seats have seen better days, but they are still superior to the business class seats in the rest of the cabin. 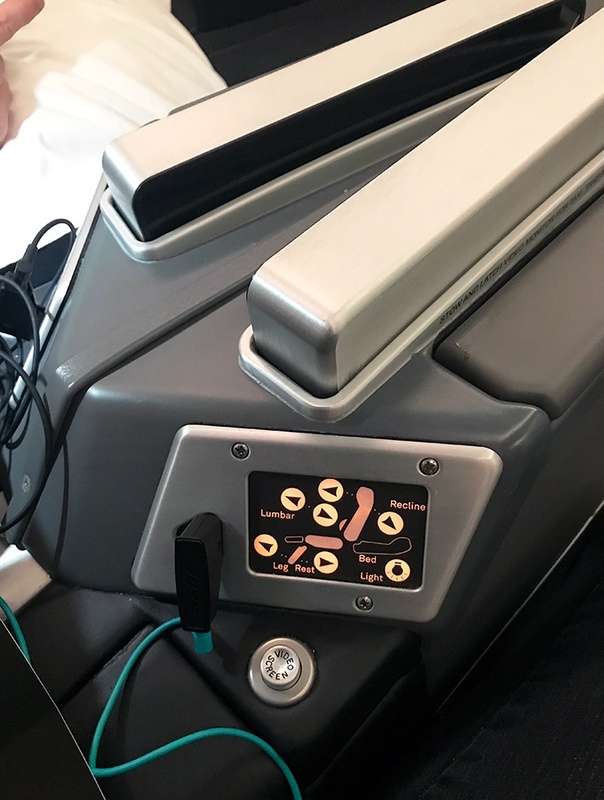 Unlike the business class pod seats, they offer a true fully flat bed making them perfect for this overnight flight. There is a dedicated QANTAS check-in for their business class passengers. If you are a QANTAS Platinum, Platinum One Frequent Flyer or hold Oneworld Emerald status you will be able to check in via the first class counters. The line for the business class check in is quite long. Not as long as general check in on the other side, but still quite a few people. Due to my status, I am checking in via first class and there is only one other person in front of me. Check in is courteous and speedy. I’m given an express pass to expedite my way through immigration and security quickly. Which at this peak time of the evening is worth its weight in gold. Qantas has a bright and airy lounge for business class passengers. 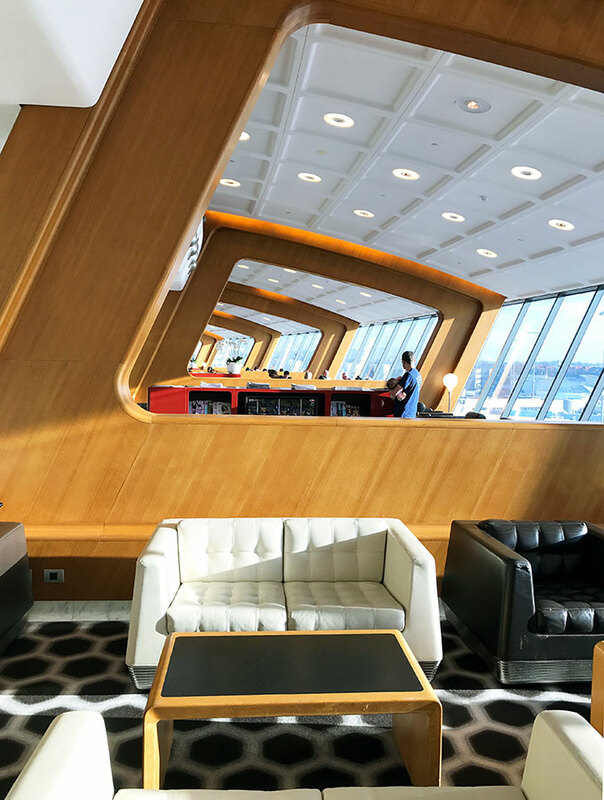 It can get quite busy during peak times as Qantas Club Members, QANTAS Frequent Flyer Gold Status and Oneworld Sapphire members also have access. 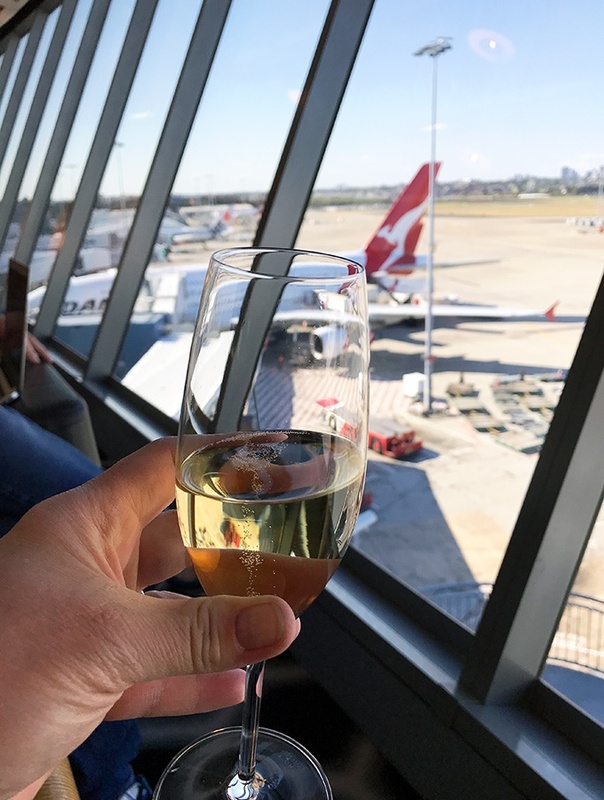 Instead, I head to the Qantas First Class Lounge dedicated to first class passengers, but is accessible no matter what class you are flying if you are Platinum, Platinum One or Oneworld Emerald. I am here early entirely to enjoy the lounge. 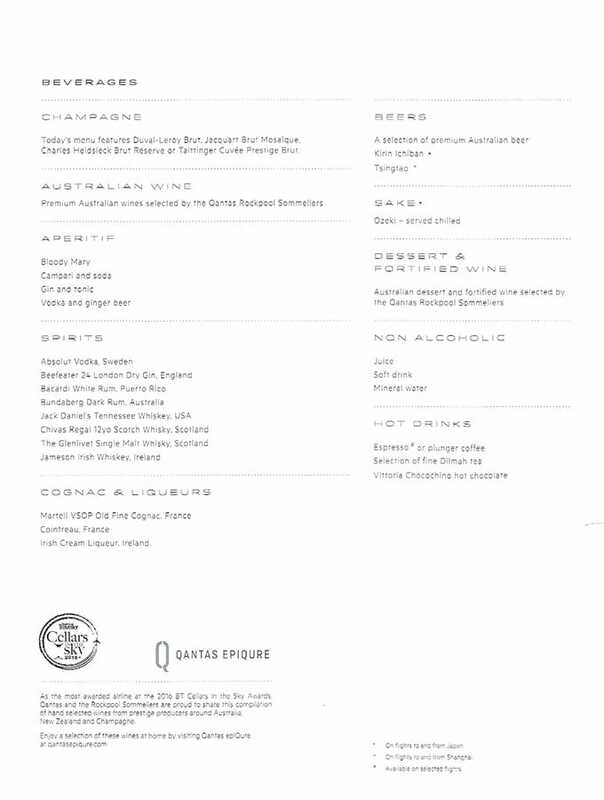 It’s an evening flight to Haneda and dinner will be served on the plane, but I still take advantage of the restaurant quality dining in the Qantas Frist Class Lounge. Boarding is relatively quick via the dedicated boarding line. Once on board, you are directed one of two ways. Business class seats are at the front of the plane (no brainer there) or up a flight of stairs to the bubble. Even in the age of the double decker A380 the “bubble” of the old 747s still excites me. In this instance, I’m not heading up to the bubble but directed up to the nose section of the plane. I walk through the main business class cabin. Which is a very undesirable 2-3-2 configuration. Being stuck in a middle business class seat does not thrill me at all, thank goodness Qantas is slowly but surely doing away with that nightmare. Into the very front section of business class I head. 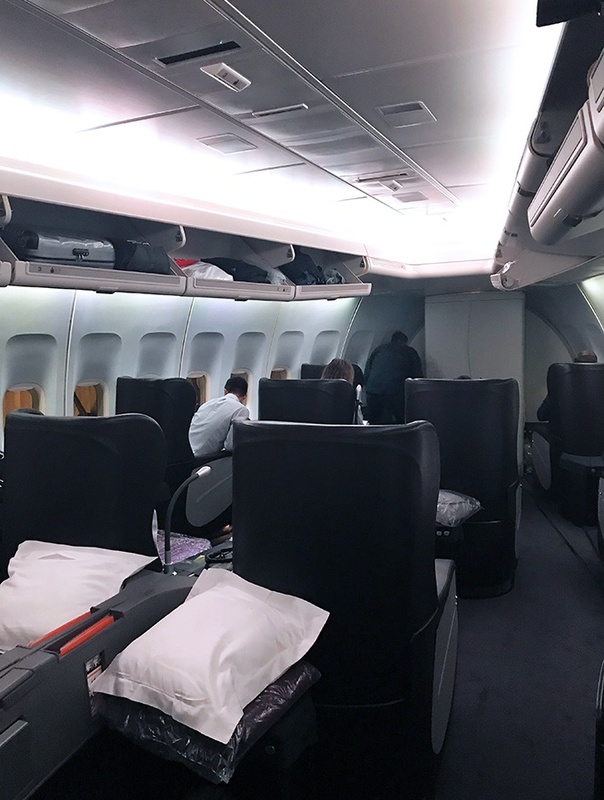 In a few of the Qantas 747-400 aircraft, the very front of business class is the old first class set up. 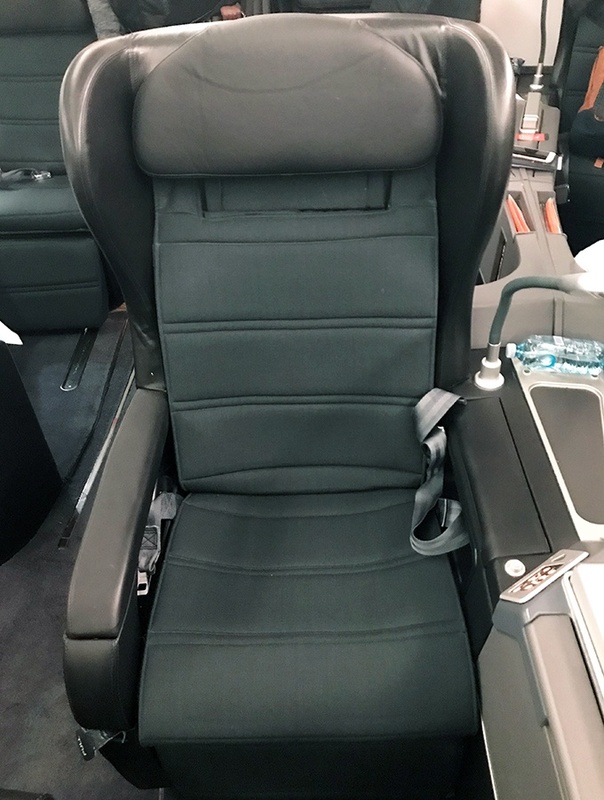 As far as I am concerned these are the best Qantas business class seats Sydney to Tokyo. Not all of the 747s, only one or two, and I know at least one is routed generally on the Sydney to Tokyo route. Qantas will retire their last six 747s by the end of 2020. 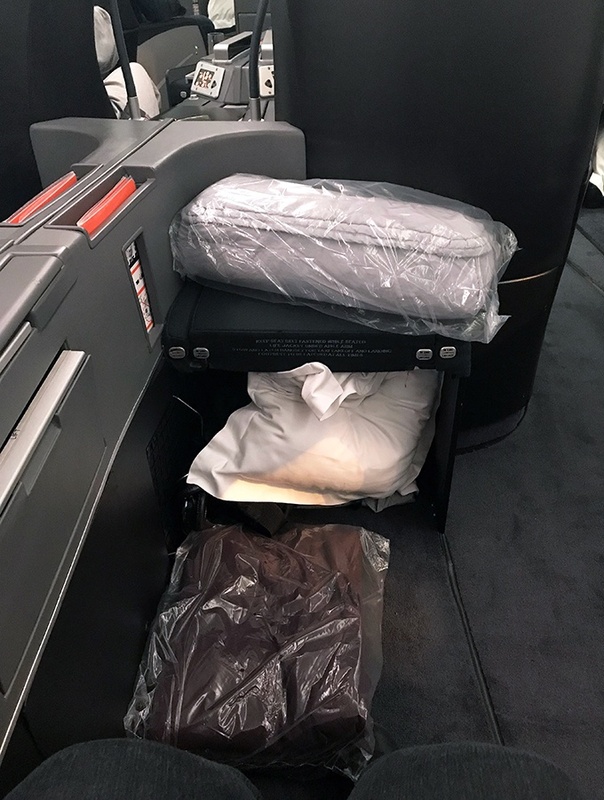 If you want to experience the best Qantas business class seats Sydney to Tokyo, a touch of first class, you need to get in quick. When choosing your seat online you can tell if the aircraft still has the old first class configuration onboard. 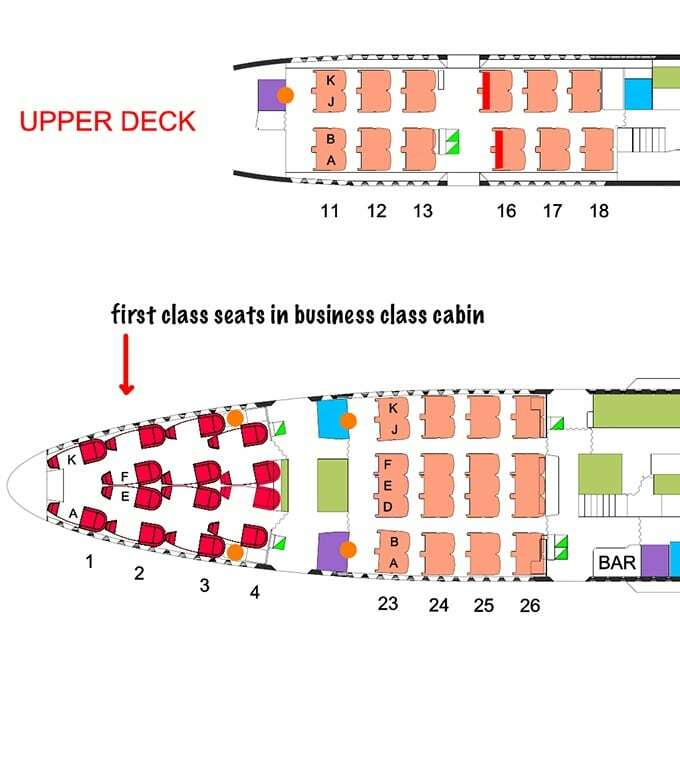 The seats in the nose of the plane will look different to the other business class seats, and they will be red, as per the screenshot from Qantas below. 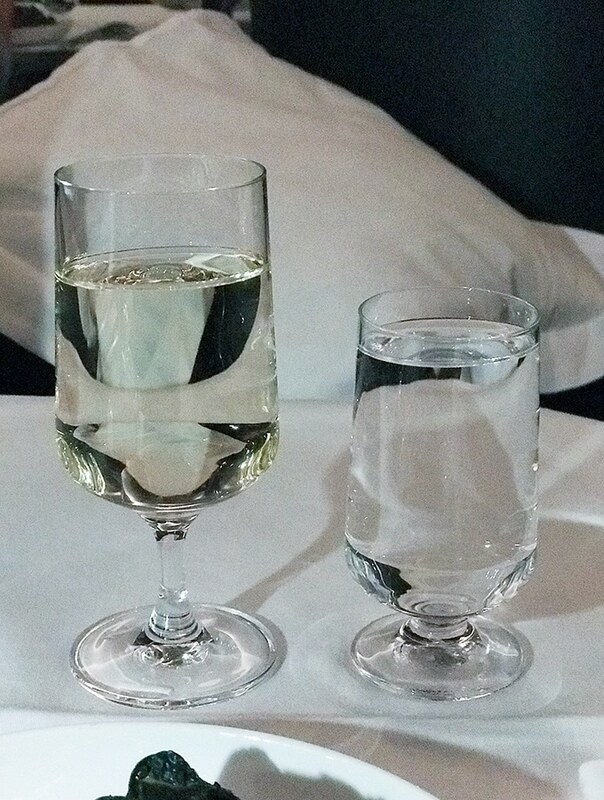 Once seated champagne, juice or water are offered. I go for the champagne, why not! Plus pyjamas are handed out. The seats are in a 1-2-1 configuration. The only storage bins are above the window seats. If you are in the seats that run the centre of the cabin you will need to use these. 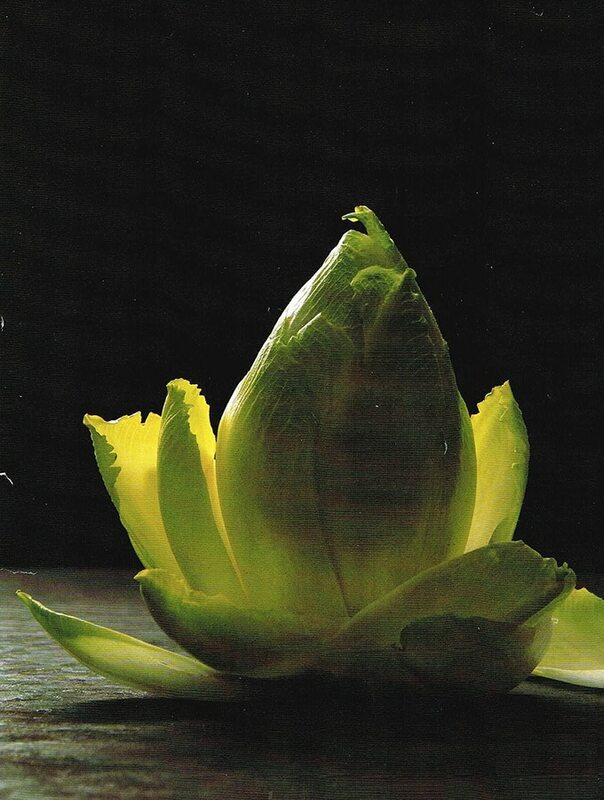 I am also advised, when I reach my centre seat, that I am able to leave my small roll on with me if I wish. I can place it under the small seat (will be the end of my flatbed) in front of me. The first thing you will notice about the old first class seats is the amount of room you have. There is leg room for miles. The second thing you will notice is the lack of privacy. This is where the old business class pod seats have the advantage, you do get a little more privacy. You get to know the person sitting next to you well. It is unavoidable, they are right there and you are sharing the same common space between th seats, which isn’t that generous. The best aspect of the seat is it is a fully flat bed. The business class pods aren’t. Qantas advertise them as a flatbed, and yes they are to a degree. That is the problem the degree of angle on them, you don’t lay flat. The old first class seats are a true flatbed. My seat is made up after take off for sleep. It is a night flight and sleep is on the agenda. There is a seat cover placed over my seat. They are very much like a thick mattress protector. This offers a little more comfort via some extra padding to sleep. Sadly these are nothing to write home about. They are tiny, old and seriously in need of replacement. You can see how tiny the screens are with the photo below. That is an iPhone in front of the screen. 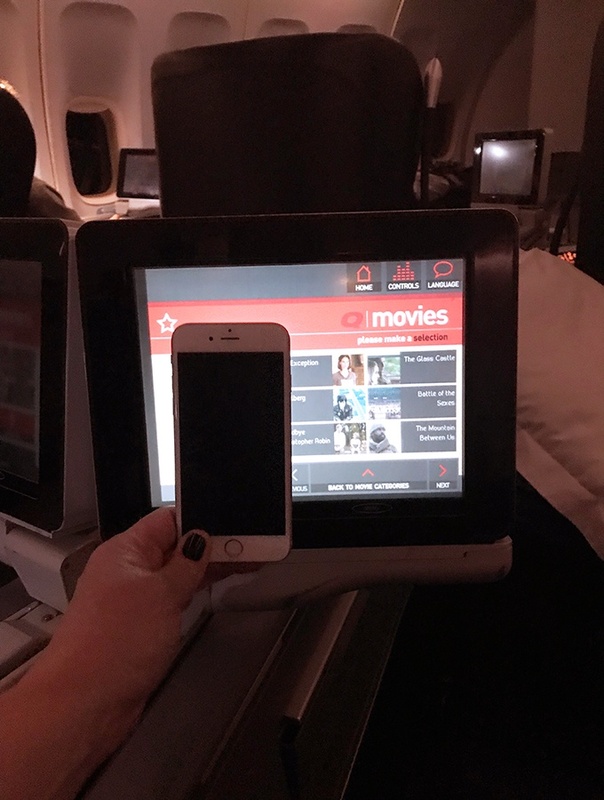 There is a decent selection of movies, it is the same inflight entertainment offered across the fleet, just on antiquated screens. 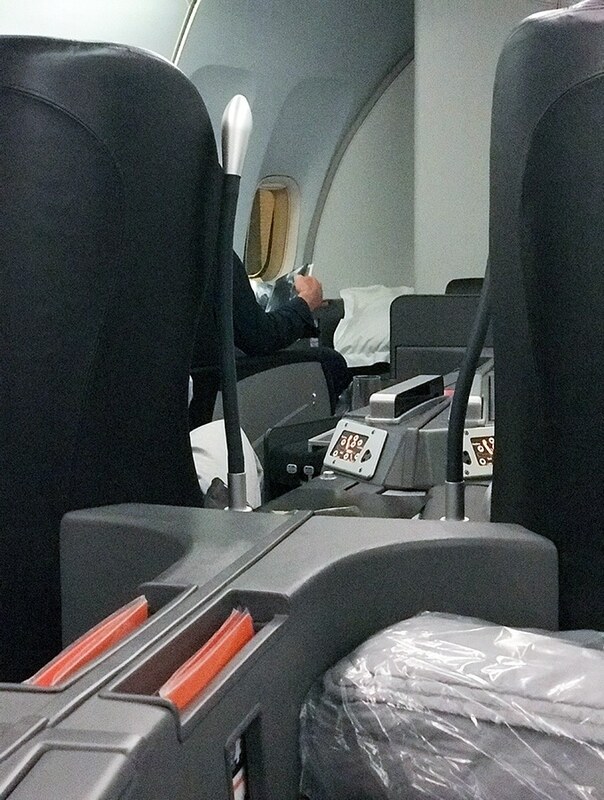 Blankets and pillows provided are the normal business class offering. The blankets are a decent thickness and I find them rather comfy to snuggle into. Once changed into my PJs, it is quite easy to nod off to sleep. 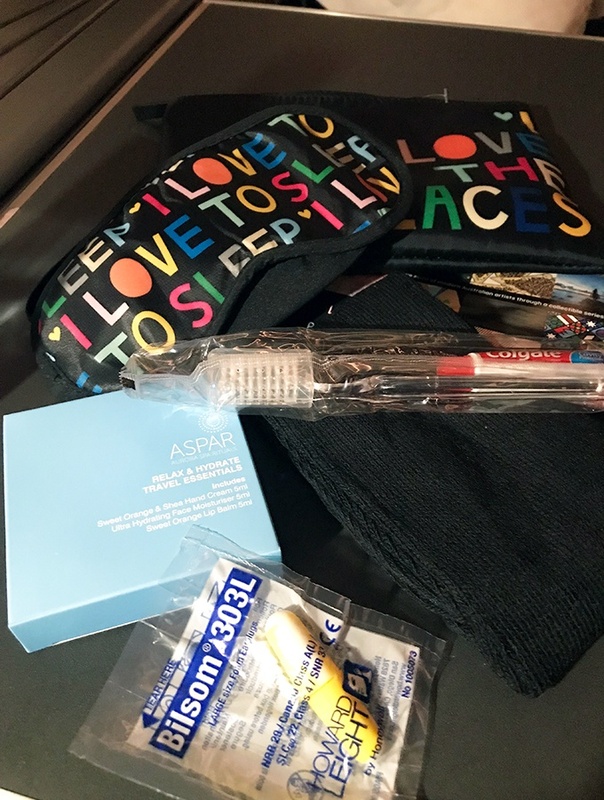 The amenities kits hold the two most important items I require when flying, ear plugs and eye mask. There are also Aspar toiletries, toothbrush and toothpaste. Dinner order is taken once we take off and seat belts signs are off. A main and dessert are on offer for dinner. 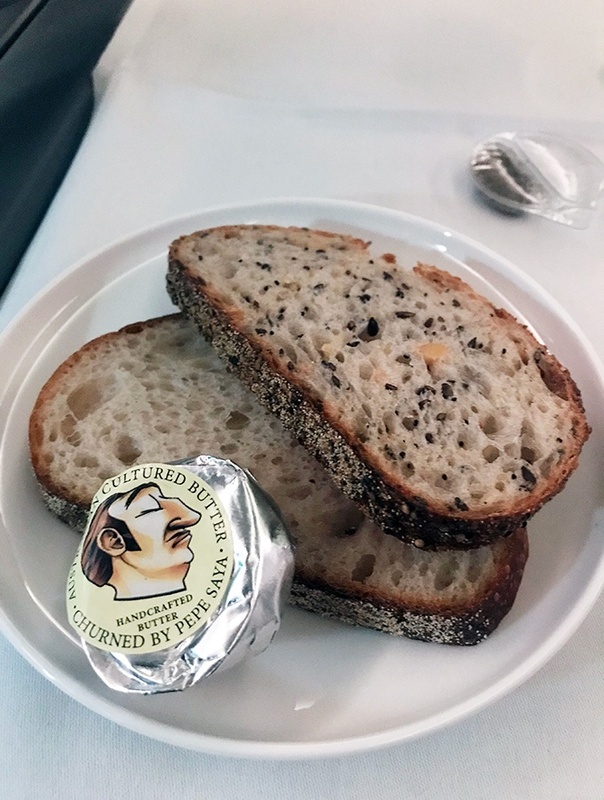 It’s always great to see Pepe Saya butter on Qantas business class flights. The butter is manufactured five minutes from the airport by artisan butter maker, Pierre Issa. It is the best butter offering, the bread is always great too, on any airline. 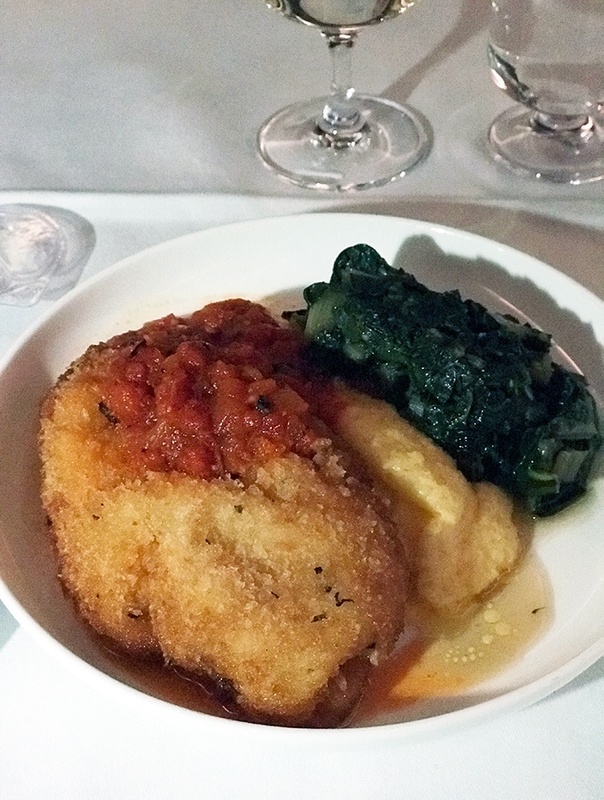 I opt for the herb and panko crumbed chicken with soft polenta, braised silverbeet and capsicum sauce. The crumb is crunchy and chicken tender and juicy. 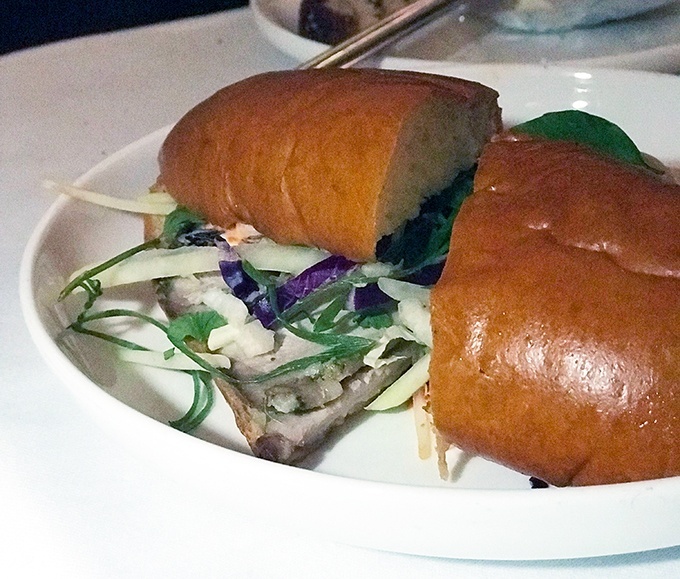 My seat buddy next to me orders the lemongrass pork sandwich with green papaya slaw, salted chili and lime mayo. I didn’t really feel like dessert but was persuaded by the lovely crew member looking after me. She sold me on how good it was, and she was right. 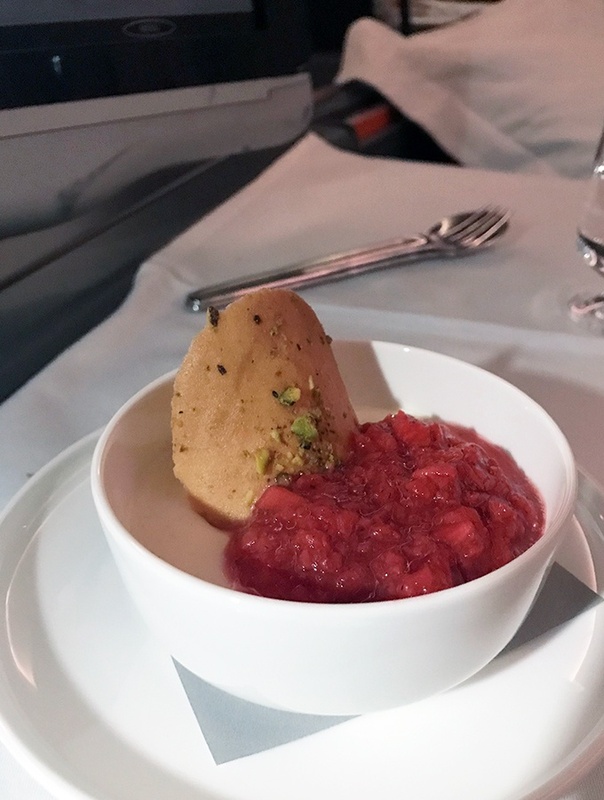 The vanilla pannacotta with strawberry salsa and pistachio wafer was delicious. After a few hours of broken sleep. I slept as well as I do on flights, and did get a couple of unbroken hours in. 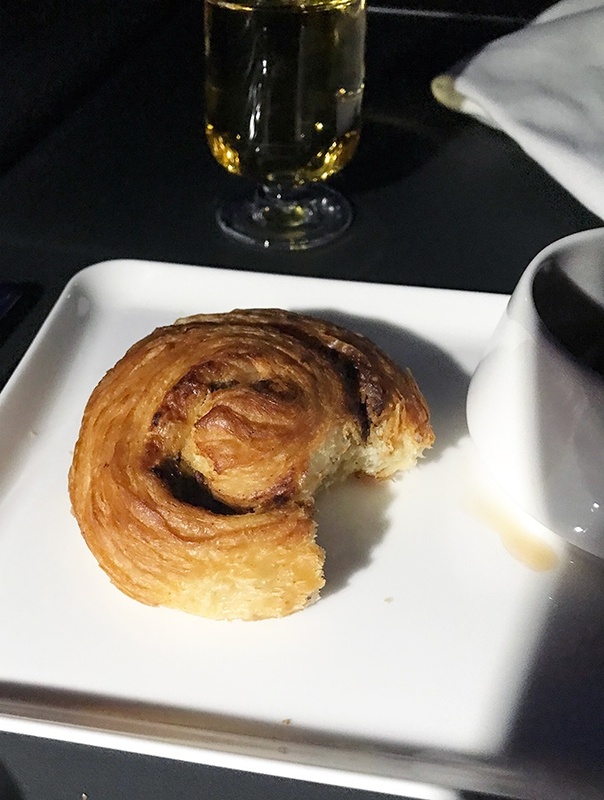 We are landing at Haneda at dawn and being served breakfast before touch down. It’s early and I don’t feel like much at all. A hot breakfast is offered but all I can stomach is a tea and a danish. 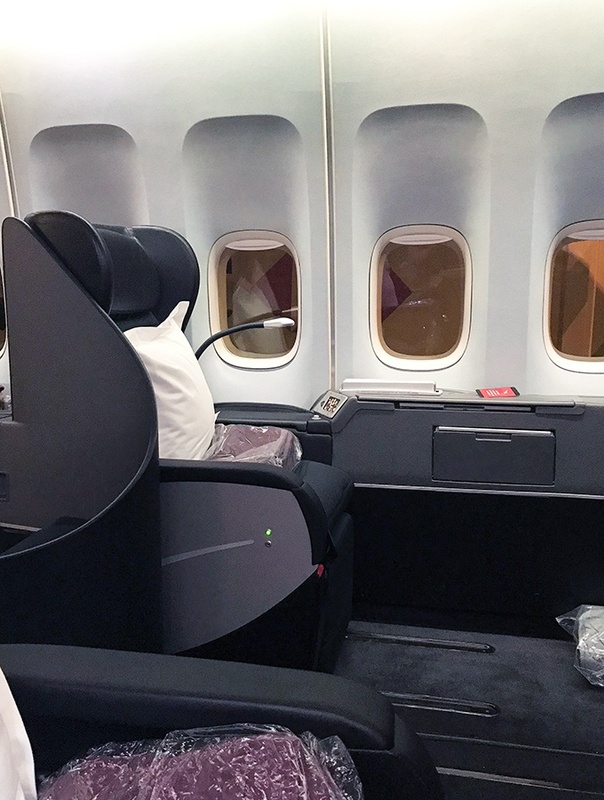 Are these the best Qantas business class seats Sydney to Tokyo? How do the old first class seats in the business class section of Qantas’ Boeing 747s stack up? They are the choice seat on the aircraft, and at present, the best Qantas business class seats Sydney to Tokyo. My second pick is the business class pod seats up in the bubble. 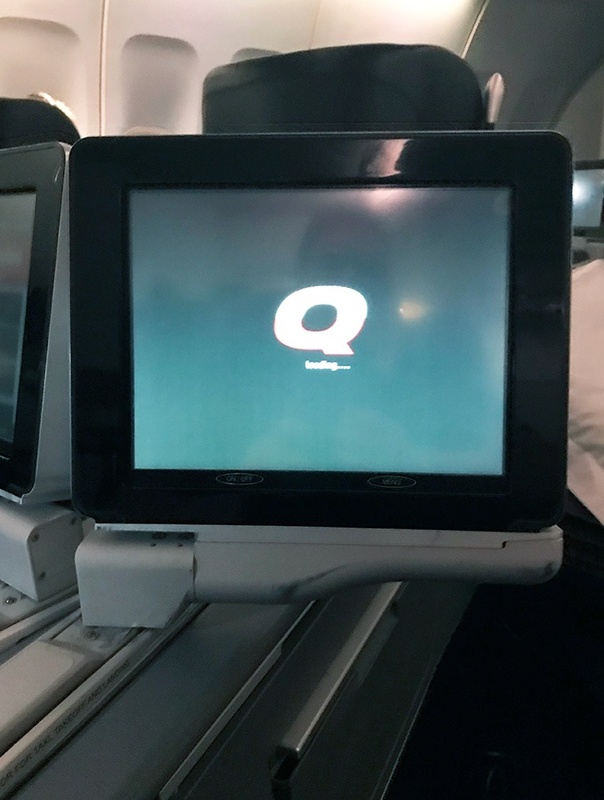 The entertainment system is antiquated, but that goes for the whole plane. For an overnight flight, which the Sydney to Haneda is, they are a fully flat bed for sleeping. Though they do lack a little privacy. I say if you get the chance to select one of the seats on this leg, do so. Wow! I’m just starting to look for plane tickets for my next international trip and dreading the long flights, so this has really piqued my interest. 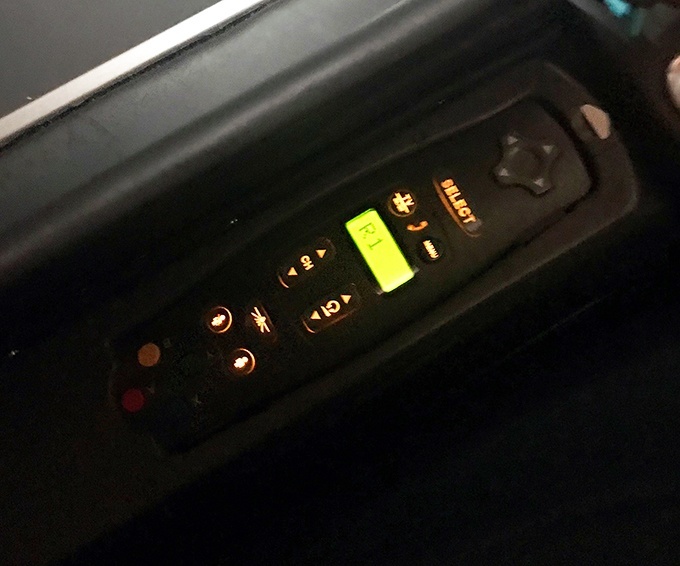 Despite these not being the latest and greatest seats, anything is better than those standard economy class seats that I normally get, and the fact that they lay completely flat sounds like heaven! 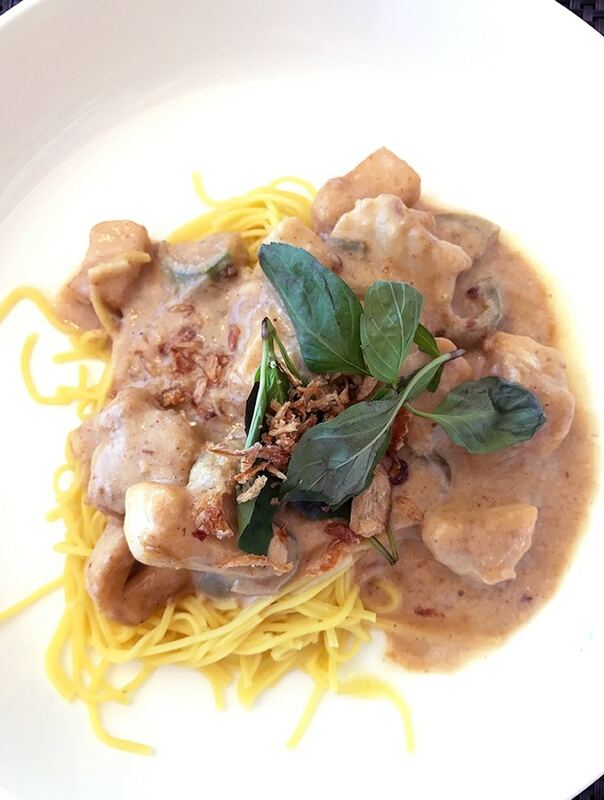 I’ll have to splurge on a long haul flight one of these days… possibly on a Qantas flight! I realize you said these seats have seen better days but I never fly business or first class and they look dreamy to me! It’s very rare that I get to turn left when I get on a plane (mostly because I usually have my entourage of kids with me!) but on the rare occasion that I do fly up front, I LOVE it! Give me a flatbed and I’m happy! This sounds like a great option for this flight plus you get the added bonus of that swanky lounge. You’re right, that is plenty of leg room and it’s nice that you were open about the lack of privacy! But on the other hand, having a total flat bed space is very tempting – I’ve never experienced that. This type of seat would definitely be worth it for me. 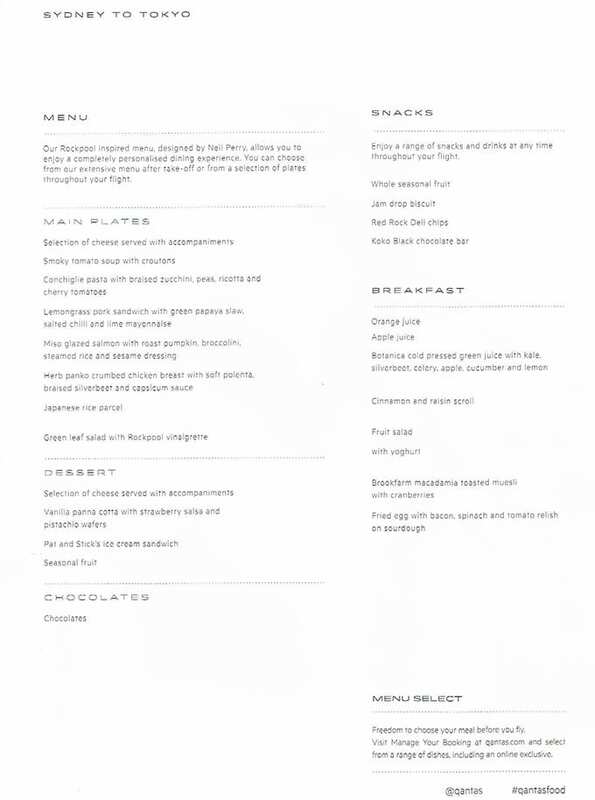 Everything about the Qantas Loyalty Scheme is fantastic, the Qantas First Class Lounge looks elegant and welcoming and good to know that its accessible irrespective of the class you are flying. The fully flat bed type seat sounds very comfortable and convenient. Can’t wait to experience ourselves. Usually just fly economy. Only experienced business class twice and first class once, as lucky upgrades. I am a very frugal person. But these descriptions just might make me change my mind for long haul flights. What a great tip, feels like one of those insider secrets that most of us never know about! Thank you for sharing. For sure, even the older design of first class flat beds are going to be more comfortable and spacious than the new generation business class seats! Pretty cool, travel hacking at its best. 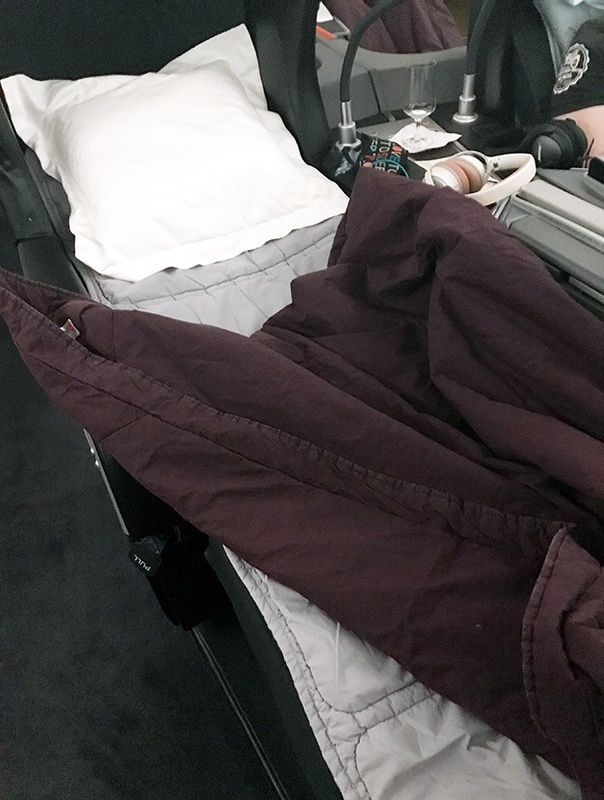 To have a bed on a long-haul flight is always a dream. Sara, it’s always great to get detailed advice when there is a big difference in seats within a class like this. Good to know what to look for on the Qantas diagram when booking. 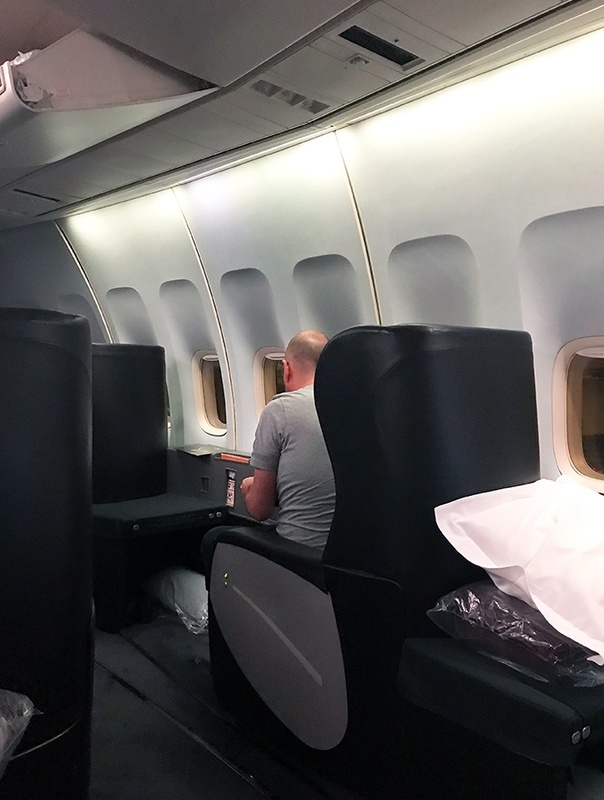 Like you, I HATE the 2-3-2 config in business class — we had it on an Emirates flight to Africa last year. Fortunately it was my sister, my daughter, and me in the center so at least you know who’s climbing over you. 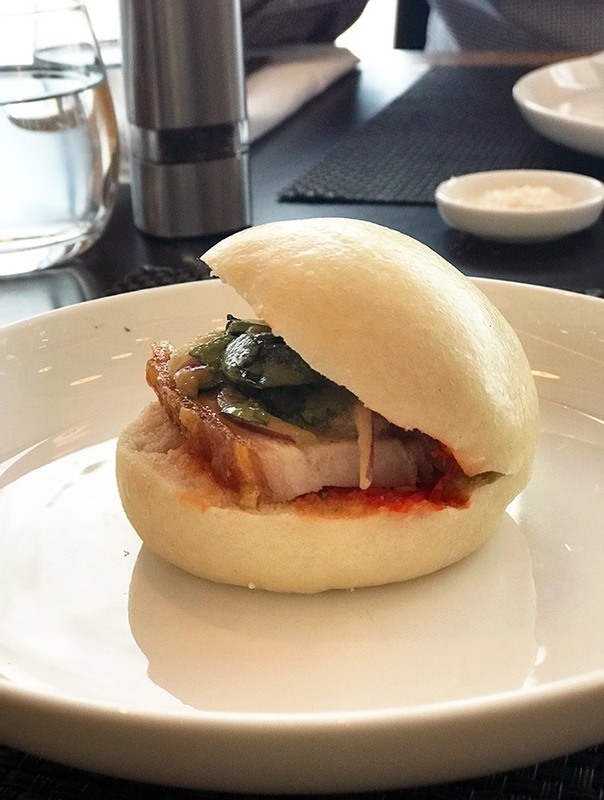 Also great to know about the Qantas lounges in the Sydney airport.